There is plenty of territories out there that you can explore on a snowmobile. In the winter time the open areas become covered in snow, but with this type of equipment, you can get where you want to go in no time. Many people enjoy riding on a snowmobile just to have a good time. Others use them as a way of life due to the location where they live and the severity of the weather. It is a favorite past time though to engage in snowmobile races because they can go quite fast along the snow. The bottom of the machine is equipped with special skis that allow it to glide over the top of the snow instead of getting bogged down in it. They also use a very small amount of fuel so you can go quite a distance on them. Most snowmobiles are very easy to handle and you can ride with either one or two people on them. Even young children are able to operate snowmobiles with parental supervision. In addition to racing snowmobiles, they are often used for exploring and for climbing mountains. It is not uncommon for people to load up their cross-country skis and then drive to the top of the mountains on their snowmobiles. This is often done in pairs so that they can ride one snowmobile to the top, ski down, and have another to take them back to the top again. The newer models of snowmobiles are able to operate at a rate of 100 miles per hour or more. This means they can be involved in very exciting races that take place along a straight away or over a particular course that is being used for the event. You do have to be very careful with a snowmobile though as you don’t want to be involved in an accident. Having the right equipment will help you avoid injuries if you can’t avoid the accident altogether. 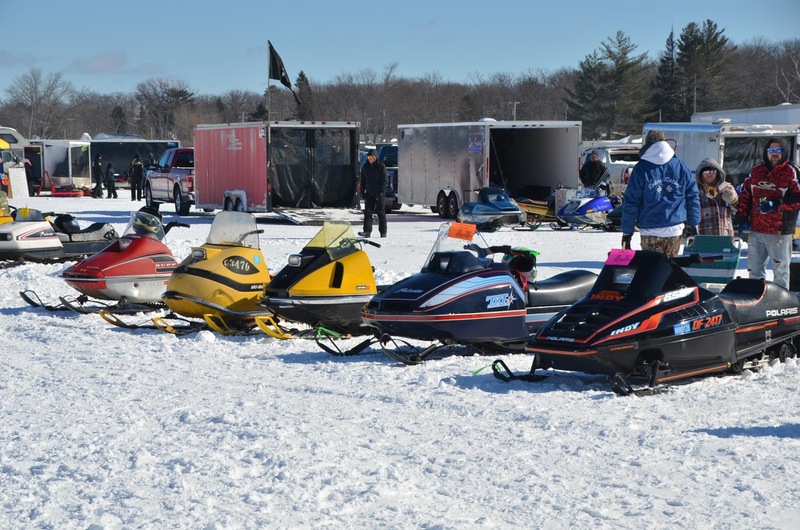 Some snowmobile races are in place among those that live in the area and want to entertain themselves. Others are sponsored by big-name companies that manufacture snowmobiles. They offer cross country races as well as those that take place on oval tracks and the competitors have to complete a set number of laps. You can win trophies, cash, and prizes if you win the various snowmobile events that are offered. 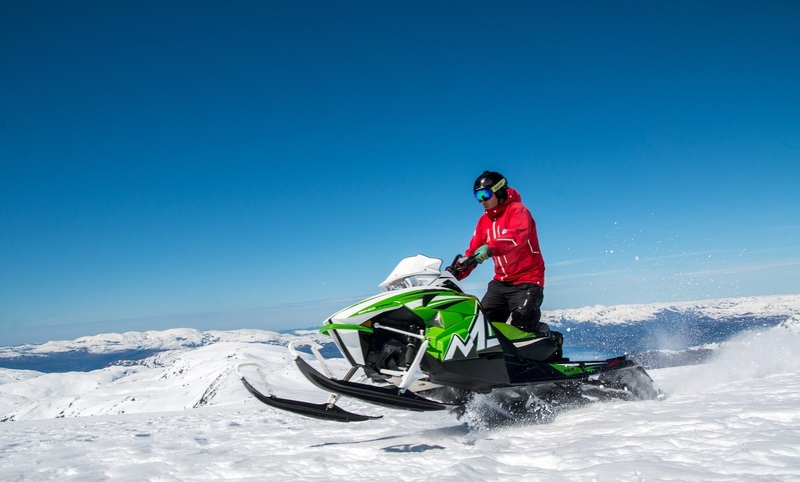 The big names in snowmobiles are Polaris and Arctic Cat. Both of them continue to come up with advanced models of snowmobiles in order to get the consumers to buy from them. In very cold areas including Alaska and Canada, there are tourist locations where you can rent snowmobiles for the day to explore. This is a great option if you are thinking about purchasing one but you haven’t made up your mind yet. It is important to wear the proper clothing and safety equipment while operating or riding on a snowmobile. Too many people suffer from either frostbite or hypothermia because they aren’t dressed for the cold weather when they ride a snowmobile. You need to dress in layers to maintain your body heat. The outer layer should be a waterproof snowsuit. Make sure you have on a hat and gloves to prevent heat from leaving your body from your head and from your fingers getting frostbite. Make sure you wear waterproof boots that will offer you good traction for when you get off the snowmobile to walk around or to add more fuel to the tank. You should always wear a helmet when you ride a snowmobile because you never know when something will be in the way. Sometimes there are things under the snow that you can’t see so an accident is unavoidable. Serious injuries and death can occur if you hit your head, and it can be a long time before help can arrive if you are exploring the wilderness on a snowmobile. 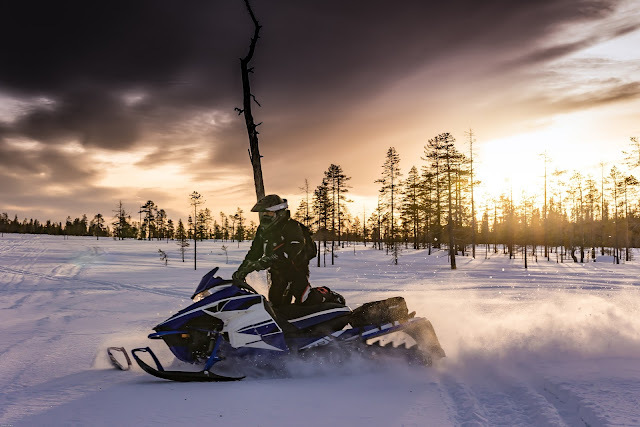 The snowmobiling industry has enjoyed a rich history that has made it possible to travel easily through the thick snow that often falls in Canada and the northern regions of the United States. For decades, snowmobiles have continually improved to meet the needs of residents who enjoy living in the colder climates and experiencing the winter months to their full potential. As with any major invention, however, the snowmobile industry was popularized by high-performance models and sports enthusiasts who have found ways to race the machines and compete against other snowmobilers in a variety of events. This industry has come a long way since the early purpose of the snowmobile as being merely a means of traveling through the snow with less difficulty. The first patent for the snowmobile was issued in 1927 to Carl J. Eliason of Sayner, WI. His idea of a machine that traveled easily through the snow was simply called a “snow machine.” He used parts from a bicycle, a pair of skis, and some parts from an old Model-T Ford to create his first machine. It was a functional contraption, but it had its drawbacks and disadvantages. Eliason’s “snow machine” was more or less a great concept that was not perfected in a way to reach the full potential of the idea. It was not until 1958 when Joseph-Armand Bombardier of Canada created and patented the machine that we know today as a snowmobile. Not only did Bombardier create and manufacture the first modern-day snowmobile, but he was also the first person to successfully market the machines to people throughout North America. His most popular model – the B7 Snowmobile – began being mass produced for sale in North America before introducing the more popular Ski-Doo model. The Ski-Doo was a more popular model of snowmobile because it was smaller and less expensive. Soon, the Ski-Doo replaced dog teams as a means to quickly travel across the snowy landscape. By the 1970s, less than 20 years after Bombardier received his patent for the first modern-day snowmobile, there were already 250 snowmobile races that were sanctioned across North America. The United States Snowmobile Association became the forerunner in snowmobile organizations. It began and continues to sponsor one of the more popular snowmobile races – a 650-mile marathon that begins in Winnipeg, Canada and ends in Minneapolis, Minnesota. It was also one of the organizations that helped to get the Snocross snowmobiling event added to the Aspen X Games in 1998, which has created the largest increase in popularity for the snowmobile industry. One of the reasons that snowmobiles have become so popular in North American society is because of their ease of use. Inexperienced users can learn how to ride a snowmobile in a very short time and begin experiencing the fun of speeding across the snowy trails. Many of the resorts in the snowy regions of the United States and Canada, including Utah, Michigan, and Alberta cater to the specific needs of vacationing snowmobilers. Winter vacation resorts commonly keep updated information on snowmobiling trails in the area along with lessons and clubs that snowmobilers of any experience level can take advantage of. Along with enjoying the fun that snowmobiles can provide is the responsibility of using the machines safely. When snowmobiling along trails or for long distances, it is a good idea to go with another rider and to let others know where you plan on riding to in case of emergency. Always bring extra food along with a first aid kit and the proper safety gear in the event that you get stranded. Before riding, inspect the equipment to make sure all of the parts are properly tightened and in proper working condition. Also, check the dangers of an avalanche occurring before leaving and try to avoid those areas. The snowmobile industry has made a huge deal of progress in the technology and popularity of the machines. Beginning as merely a means to travel across the snowy lands with less difficulty, the industry has enjoyed a surge of popularity due to the many recent racing events and competitions. Now, snowmobiles are popular among all age groups and they can be thoroughly enjoyed as recreational vehicles when proper safety precautions are followed. Once a person gets over their distaste for winter weather conditions, operating a snowmobile can be an addictive winter sport. Being in the wide-open landscape that is covered by a fresh coating of white, pristine powder can be breathtaking and even enthralling for first-time snowmobilers. It is also a great way for families to spend time together while remaining active during the winter months instead of gathering around the television for a few hours every night. After learning the basics of operating a snowmobile, conquering the white blanket of fresh snow will be an exhilarating activity that families and friends will undoubtedly cherish together. The first thing to always remember is to wear your safety gear before operating your snowmobile. Safety equipment consists of a regulation helmet and a pair of goggles designed for cold weather activities. It is important to make sure this equipment is fastened correctly or else it could cause problems during the snowmobiling excursion. It is also a good idea to wear a snowmobile suit that is specifically designed to protect the body from the frigid elements of winter – such as a waterproof inner lining – so snowmobile riders do not suffer from a case of hypothermia. A good pair of gloves is also vital because the hands will be controlling most of the actions of the machinery. Cold hands do not make for quick reactions, so winter gloves are an absolute essential. Next, get comfortable with the machinery. Sit on it, move around, and get familiar with the feel of the snowmobile’s intricate details. Find the right distance on the seat so that the handlebars are within an acceptable reach from your body. Stretching to reach the handlebars is not an effective method and neither is sitting too close so that you are scrunched up against them. Keeping the handlebars at arm’s length, as long as it is a comfortable distance, is ideal. Also, place your feet in the stirrups that sit on the front lower area of the snowmobile. Get the feel for the stirrups and do not take your feet out of them when you are snowmobiling. They are designed to help you stay in control of the machinery when you make sharp turns on the snowy terrain. On the handlebars, find the throttle. This will typically be a lever that is on the right side of the snowmobile’s handlebar. Use your thumb to control the throttle, which negotiates the amount of speed desired. Similarly, on the left, you will generally find the brake lever on the handlebar. It does not take much pressure to pull the brake lever in order to slow down your snowmobile. For rides on softer and less compact snow trails, releasing pressure from the throttle will slow your snowmobile quickly. On more compact and smoother snow trails, however, you will need to apply pressure to the brake lever to achieve a stop. On the ice, as you would in a vehicle, pumping the brakes by applying and releasing pressure on the brake lever will result in a smoother and typically safer stop on a snowmobile. Now that you have found the throttle and the brake (the two most important parts of any vehicle), you are ready to begin moving. To do this, apply pressure to the throttle. Apply ample pressure to slightly rev the snowmobile’s engine until it begins to move. As you move forward, turn the handlebars in the direction you want to travel. When making a sharper and faster turn, it is best to lean into the turn. For instance, if you are making a sharp right turn, lean your body to the right without removing your feet from the stirrups. The stirrups help to stabilize your body while helping to prevent the rider from slipping off of the machine. For beginners, ride your snowmobile on the trails that have been packed and already traveled until you get the feel for snowmobiling. Veering off into unpacked snow might get your stuck or even cause an accident with another snowmobiler. Following these basic steps is essential for first-time and inexperienced snowmobilers to successfully practice this fun winter sport. As always, safety is the first issue to be addressed before operating any machinery. But above the safety precautions, knowing how to turn and lean into a turn is important for operating any snowmobile safely. Once learned, it will most likely be a winter pastime that will be enjoyed for many frigid seasons to come.